For years, many Americans have watched as farms and ranches in their communities have been transformed into new housing developments, shopping centers, and soccer fields. We've seen the stories in the news. We've heard from concerned farmers and citizens across the nation who told us they saw farmland seemingly vanish in front of their eyes. There's been a lot of anecdotal evidence. But now, with the release of "Farms Under Threat: The State of America's Farmland," we have proof. Hard evidence that America's farmland is disappearing. Maps of the contiguous United States were released as part of Farms Under Threat to show actual patterns of farmland loss within counties. Additional information, more maps, and the exact statistics used can be found in the full Farms Under Threat report. The development of agricultural land is shown in relationship to the low-to-high continuum of productive, versatile, and resilient values for agricultural land. The conversion of agricultural land to urban and low-density residential uses between 1992 and 2012 is shown as high (dark brown-red, > 25% conversion within a 10-kilometer (6.2 miles) radius), moderate (light brown-red, 10–25% conversion) and low (tan, 5–10% conversion). Urban areas are shown in gray. Agricultural land in the continental United States, shown here in shades of yellow and green, encompass roughly 912 million acres of non-federal land, including cropland, pastureland, rangeland and woodland associated with farms. This agricultural land provides a rich and varied landscape that is part of a larger mosaic of land cover/uses, including forestland, federal land, federal land grazed bylivestock, and other rural land, as well as urban and low-density residential development. Farmers and ranchers use over one billion acres, or 55 percent of the land in the continental United States, which includes agricultural land and federal land used to graze livestock. This map depicts only these land uses to show the broad extent of land used for agricultural production. The productivity, versatility, and resiliency of agricultural land for long-term cultivation largely depend on the quality of the soils, the farming infrastructure that exists, and climatic conditions, such as the length of the growing season. PVR values are calculated using data of the PVR factors and expert-based weights. Lower PVR values are shown by lighter tones, indicating land that has progressively greater limitations, may be more prone to off-farm environmental impacts, and that offers less potential for food and crop production and narrower choices for agricultural production in general. Agricultural land with PVR values between 0.43 and 1.0 is the land most suited for the intensive production of fruit and nut trees, vegetables, staple foods, grains, and animal feed with the fewest environmental limitations. 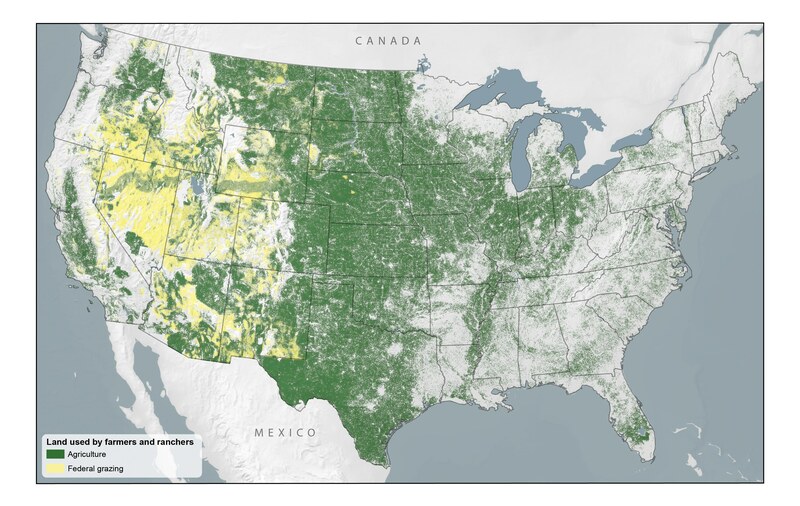 This land represented about 36 percent of U.S. agricultural land, or only 16.7 percent of the total land area in the continental United States in 2012. This national report is the first step in a multi-year initiative. It will be followed by a separate report that analyzes past farmland loss state by state and looks at the effectiveness of state farmland protection policies. Then, AFT will assess a range of future threats, forecast potential impacts to 2040 at a county level and recommend effective policies at all levels that help conserve agricultural land. Stay up to date on the latest releases. Sign up for email updates on Farms Under Threat. American Farmland Trust is grateful to the following individuals for committing their time, energy, creativity and expertise to the Farms Under Threat Initiative.